Disclaimer – This is not a review of Golden Dragon. When you visit a 110-year-old hotel’s 40-year-old restaurant. it’s not just food that you eat; there are stories, memories and anecdotes that create an experience worth remembering. 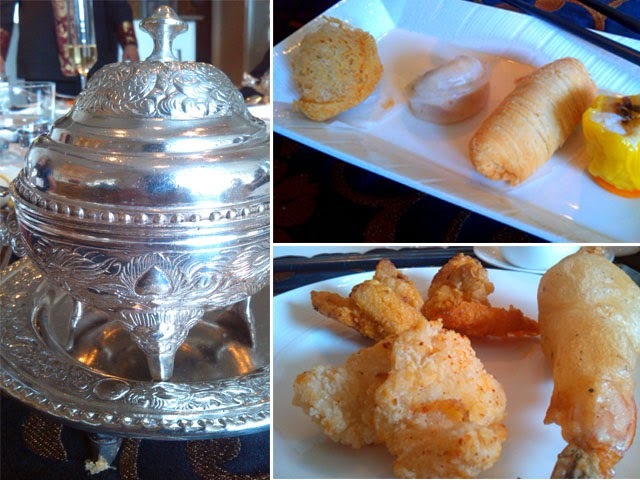 Last week I was invited for lunch at Golden Dragon, The Taj Mahal Palace’s Chinese restaurant. The idea was to introduce food bloggers/writers to restaurant’s dining experience with a menu including signature dishes and regular favourites. A small group of three food writers; Romi Purkayastha of Follow The Eaten Path, Roxanne Bamboat of The Tiny Taster and me joined by Nikhila Palat – Taj Mahal Palace’s Public Relation Manager and Parveen Chander – the Deputy General Manager at The Taj Mahal Palace, was hosted at this 40-year-old restaurant. 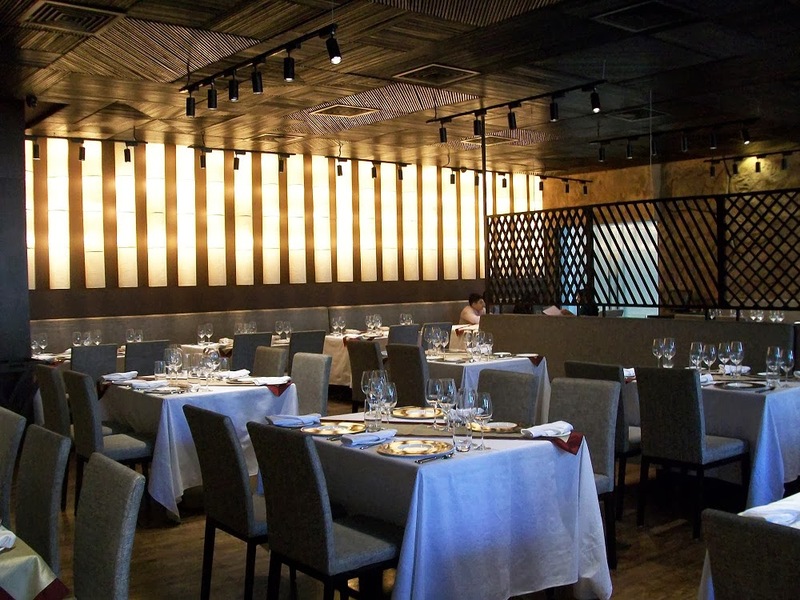 Opened in 1973, Golden Dragon was the first restaurant to bring authentic Chinese cuisine to Mumbai. At the time when Chinese food meant Indo-Chinese or Kolkata-Chinese for us, Golden Dragon introduced Mumbaikars to Szechuan and Cantonese cuisines. A fleet of five chefs was flown in from China to get the right cooking techniques and authentic flavours. 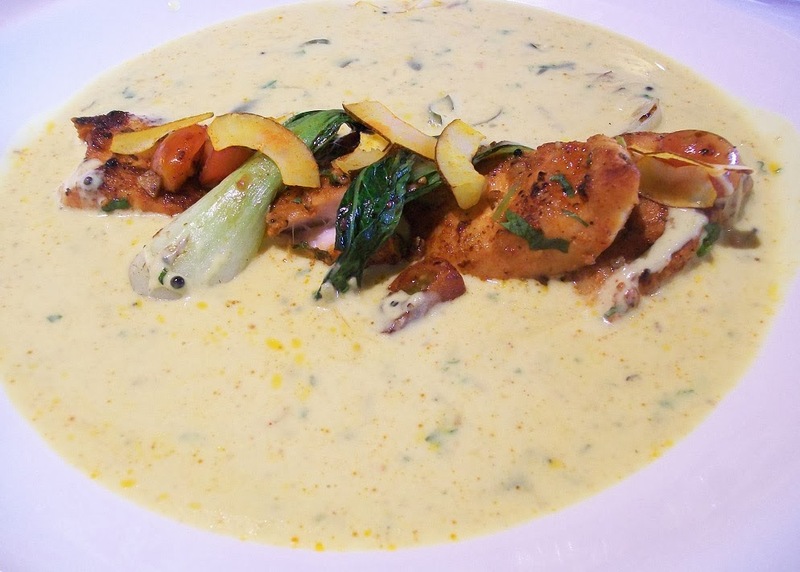 They carried their own pots and ladles and no one except those five chefs was allowed to touch them, until an Indian chef convinced them that he was worthy of cooking their food. With stories like these, our meal started with a cup of traditional Chinese tea which was served from a pot with an unusually long spout. This peculiar pot was used to serve tea in the times of war. It allowed the server to pour tea from a distance stopping him from overhearing the private (read top-secret) conversation. Tea was followed by a dimsum platter which had a mix of signature as well as new dishes. I loved the Flaky radish dimsum – grated radish wrapped in a flaky, deep fried shell, which has been on the menu since the time Golden Dragon opened. The other favourite was the crunchy Lotus root and celery dimsum. These were lapped up with sweet chilli sauce, the best I’ve had in Mumbai so far. 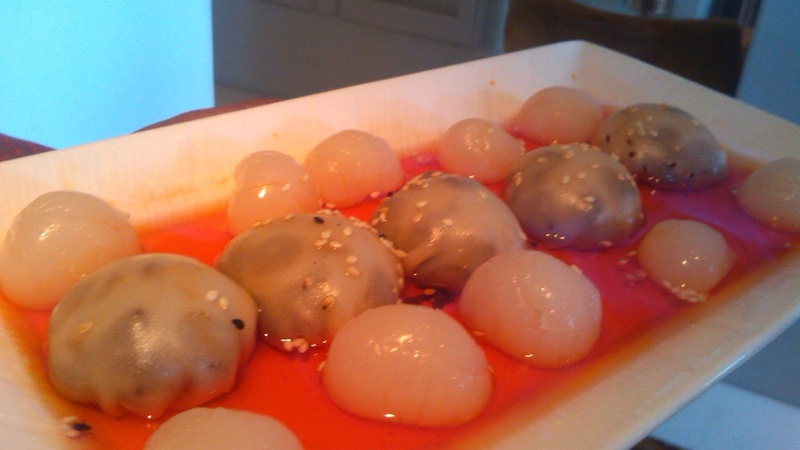 Golden Dragon has one of the best dimsum selection in the city and has a special dimsum lunch menu on Sundays. Despite being a non-vegetarian I preferred the vegetarian dimsum, but the Crispy prawn taro with it’s crispy, mesh like coating is a must try too. 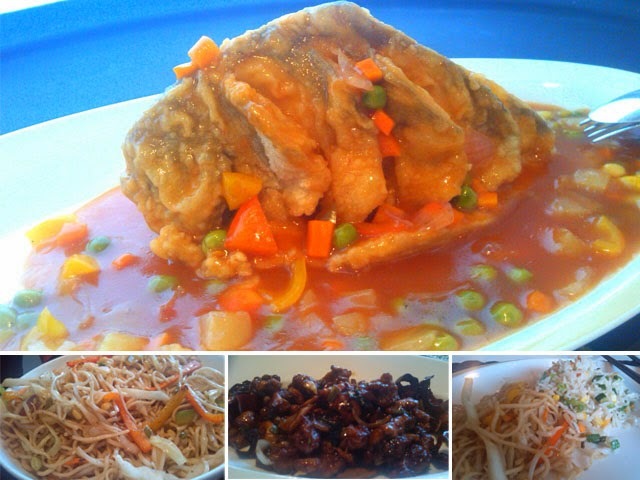 The appetizers’ platter was a mix of dishes made popular by Golden Dragon. The Golden fried prawns – prawns coated with a thin batter and deep fried, is something you’ll find on every Chinese restaurant’s menu. 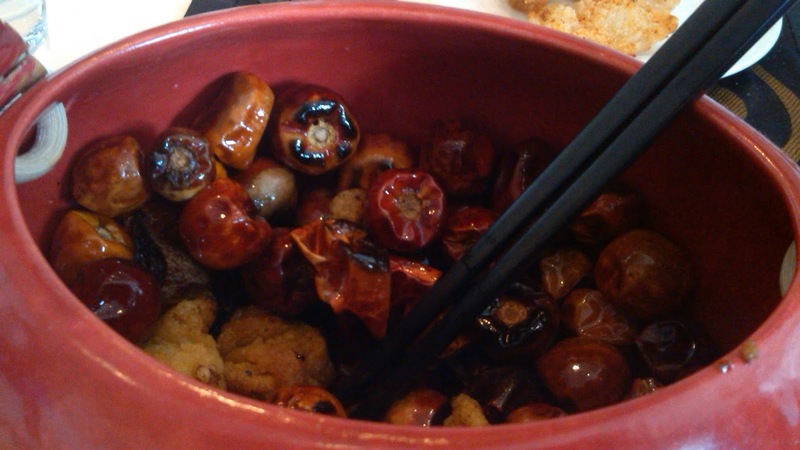 Contrary to the popular belief, that authentic Chinese food is bland, the food from Sczechuan region is extremely spicy, thanks to the famous fiery chillies. 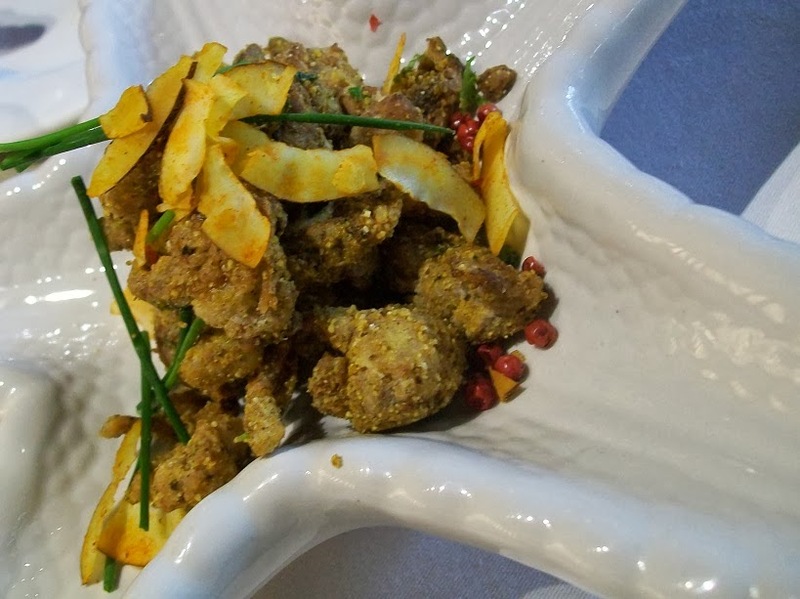 The Song of the dragon chicken – batter fried chicken is served in a pot of hot chillies. One has to dig through the pile of chillies to reach the chicken. The Standing pomfret (named so because it’s presented in a way that it looks like it is standing) – steamed pomfret in a sweet and sour sauce was more appealing visually. The sauce somehow overpowered the fish. From the main course I loved the Konjee crispy lamb – spicy stir fried lamb, another favourite at every Chinese restaurant. The Fried rice was light, mildly flavoured with fresh and crunchy vegetables and so was the Hakka noodle. What I loved about their dessert is that they were not your run-of-the-mill honey noodles with ice-cream etc. The Toffee banana – banana coated with sticky toffee, was a bit of a struggle to eat but the Candied ginger and bitter chocolate dimsum was absolutely beautiful. 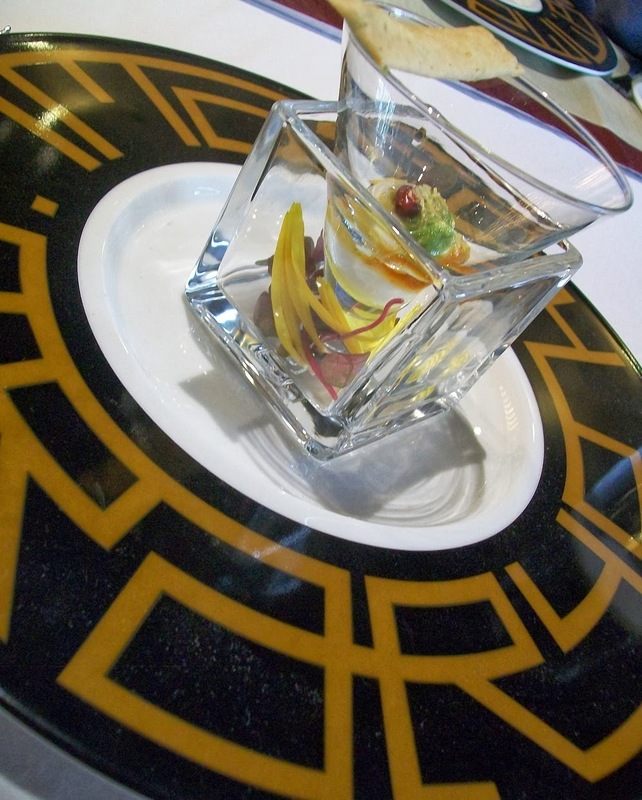 Served in an orange reduction, it had fresh litchis as garnish. The perfect ending to this absolutely soulful meal was meeting Chef Hemant Oberoi, the Executive Chef (and a legend) at Taj Mahal Palace. It’s delightful to see that a city where restaurants open and shut every few months, places like Golden Dragon have held their ground and are serving great food despite the tough competition from stand-alone restaurants. 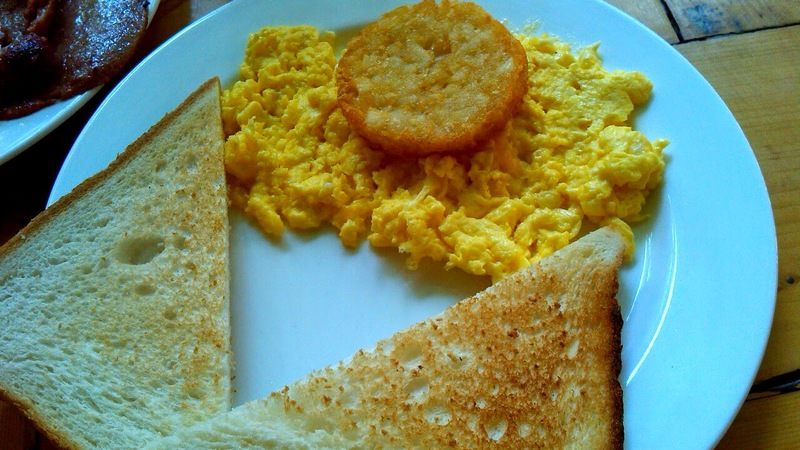 It was Sunday morning and I woke up craving a big breakfast, preferably English breakfast. Sadly, there aren’t many places serving a good English breakfast in Goregaon and Malad and going to Indigo Deli burns a big hole in the pocket, especially during month end. While I was thinking of options I remembered Chef Joel D’souza tweeting about a place in Orlem, Malad which serves English breakfast. 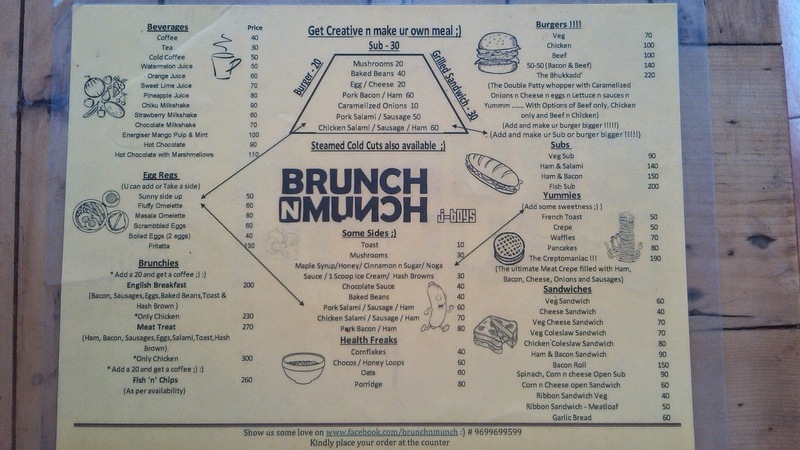 Orlem has some very shiny gems hidden in its by-lanes and the three month old restaurant/cafe Brunch ‘n’ Munch is definitely one of them. Located in the same lane as Uncle’s Kitchen, this restaurant is sandwiched between a tattoo parlour and a salon, all three owned by the same guy J’son D’Souza. We found the 20 odd seater packed when we walked in at around 12pm. We sat in the outside section which gives a feeling of a side walk cafe. Since the restaurant is in one of the quieter lanes, there was no traffic snarls or market chaos. It was too hot and we were desperate for some chilled beer but sadly they do not serve alcohol, not yet. We hope they acquire the liquor license soon and add that missing note to the perfect Goa like ambiance. 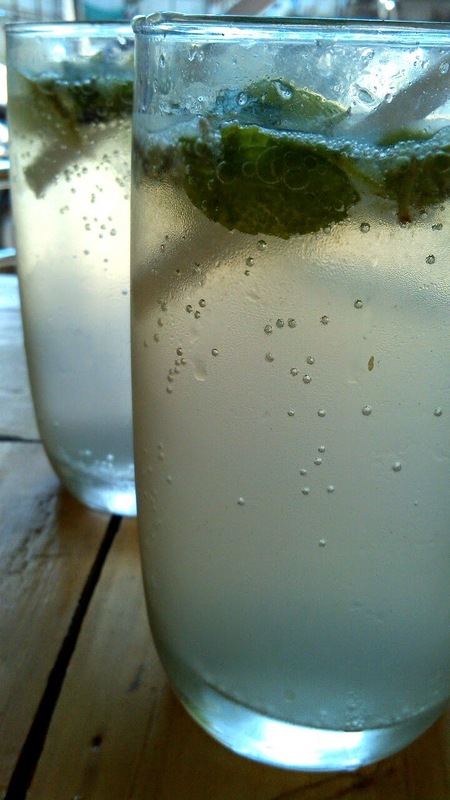 Till that happens, you can settle for the Virgin mojito which was pretty refreshing. 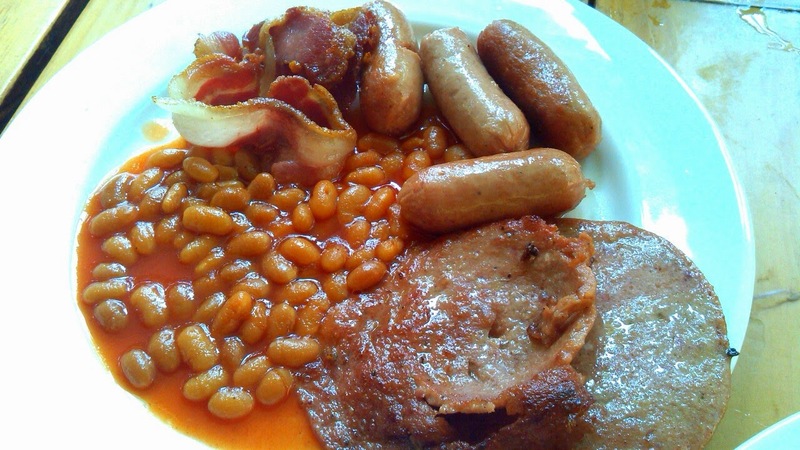 we ordered an English breakfast (Rs 200) with scrambled eggs, toast, hash brown, baked beans, salamis, sausages and bacon. The glistening meat on our table was enough to whet my appetite. I dug in my big breakfast while the recently-turned-vegetarian husband nibbled on a toast and waited for his vegetarian burger (Rs 70). The burger had a vegetable patty and the buns were really fluffy. 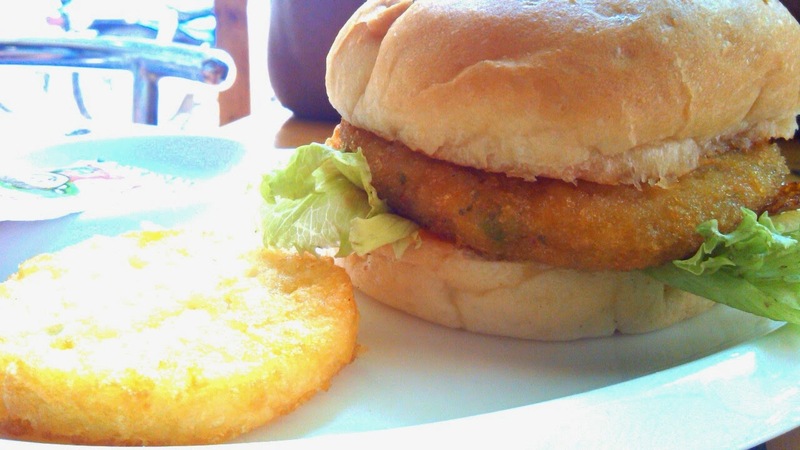 It tasted a bit like McDonald’s Mc aloo tikki, only bigger. They have some meat heavy burgers like the bacon beef, the bhukkad with double beef/chicken patty, bacon, eggs etc. 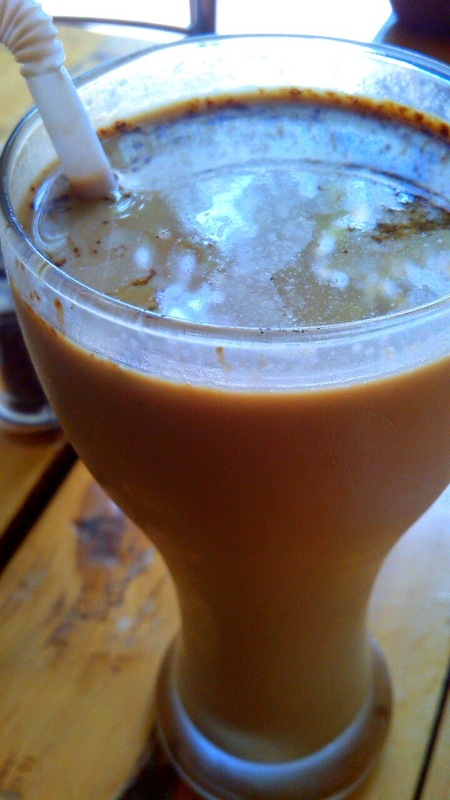 The Cold coffee (Rs 50) was a no frills attached drink – plain, simple and chilled. Something you would make at home. 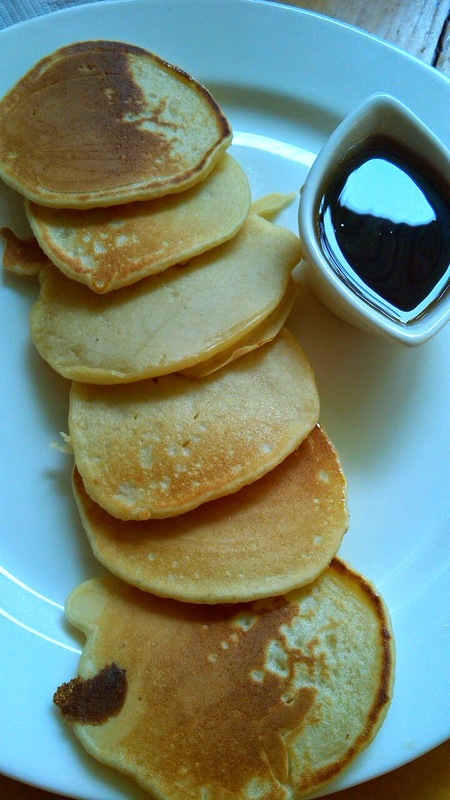 The small, almost bite sized pancakes were fluffy and were served with maple syrup. We were absolutely stuffed by this time but wolfed down the last bit of pancake with the syrup. 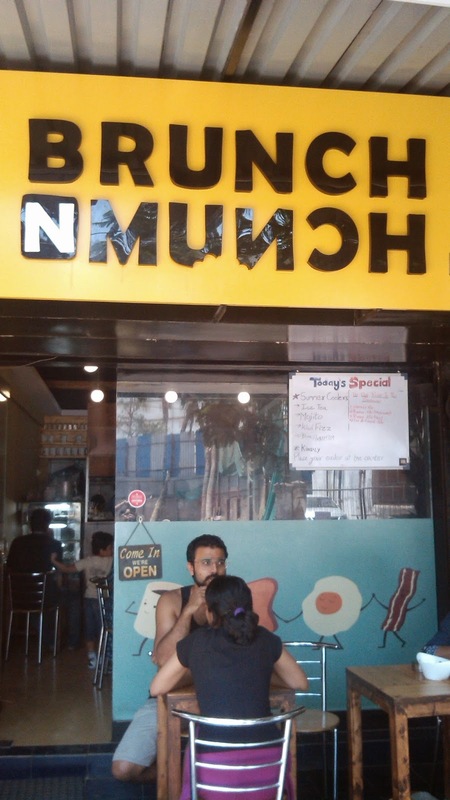 Finally, I have found a place close to my house where I’d love to plonk myself every Sunday for a hearty breakfast. If you’re an animal lover you’ll love this place even more because there’s a pet clinic next door. 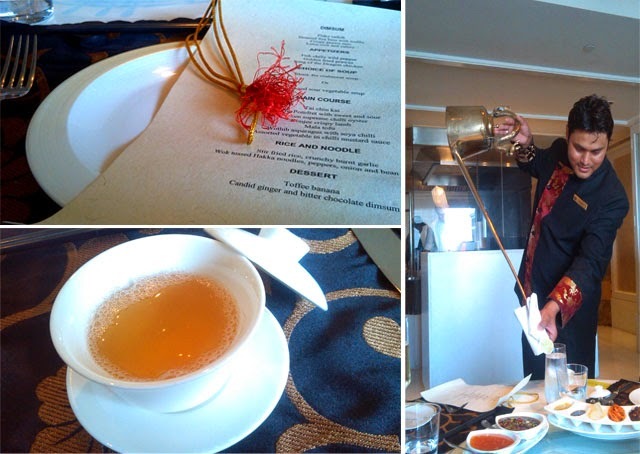 Two days before Masala Library threw its doors open to the public I visited the fine dining restaurant for lunch. Zorawar Kalra, son of Jiggs Kalra accompanied me and guided me through the tasting menu crafted by the young Chefs Himanshu Saini and Saurabh Udinia. Masala Library is the new addition to the ever growing list of fine dining options at Bandra Kurla Complex. The brightly lit interiors, beige chairs and stone textured walls might not leave you awestruck but one look at the menu and you know that the restaurant means business when it comes to food. 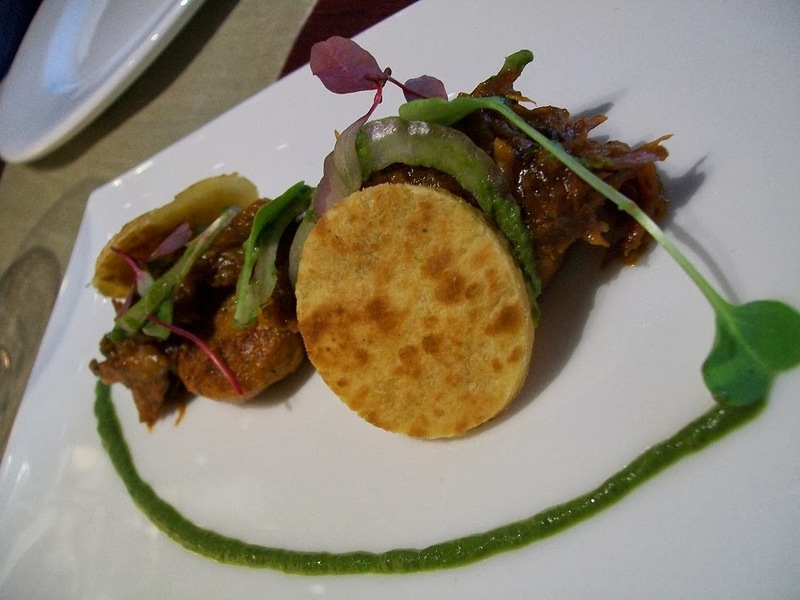 The restaurant focuses completely on Indian regional cuisine enhancing it using modern techniques. As we sat down to begin our meal our server brought a bottle of hand sanitizer. I realized that the staff takes after their boss when Zorawar produced a small sanitizer bottle which he carries around in his pocket. 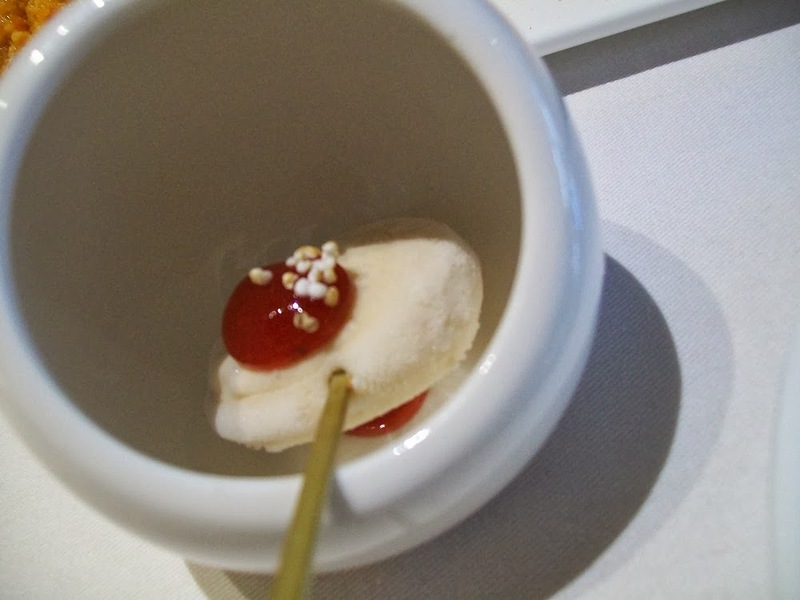 The meal began with amuse bouche, bite sized display of molecular gastronomy. We were first served Yoghurt spheres & papdi chaat where the yogurt was converted into a soft ball, topped with chutney, sev and micro greens and accompanied with a flat papdi or cracker. The yogurt ball burst in our mouths releasing yogurt and green chutney; a complete scientific take on the street food keeping all the flavours intact. 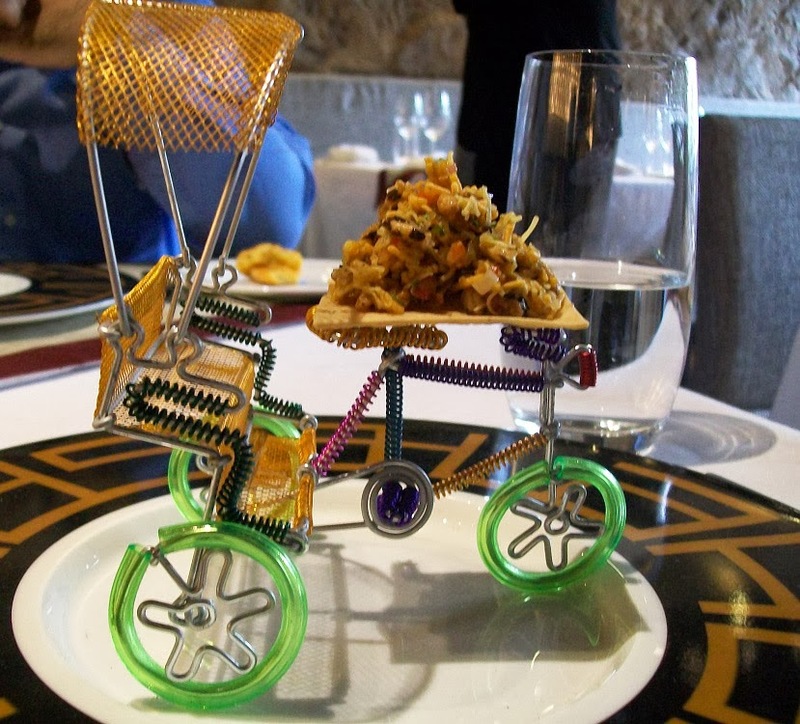 Next arrived Sevpuri on the go made with wild rice puffs served on a miniature cycle rickshaw handmade by craftsmen in Delhi. 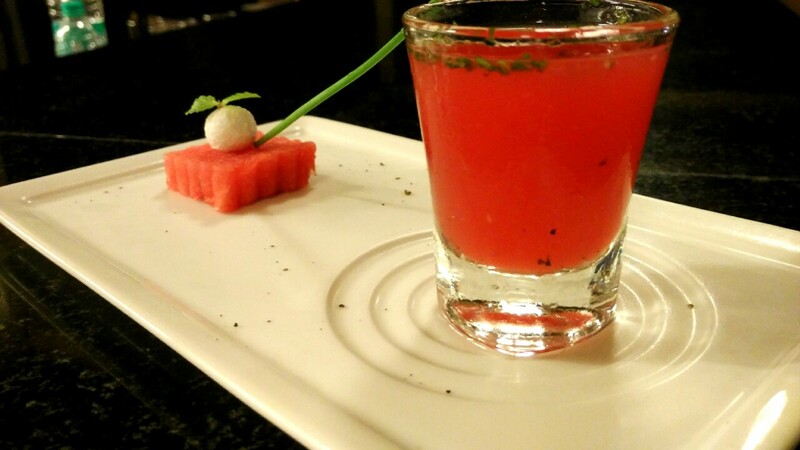 It’s not just the menu at Masala Library which takes inspiration from scientific cooking, there bar menu includes molecular mixology based cocktails too. 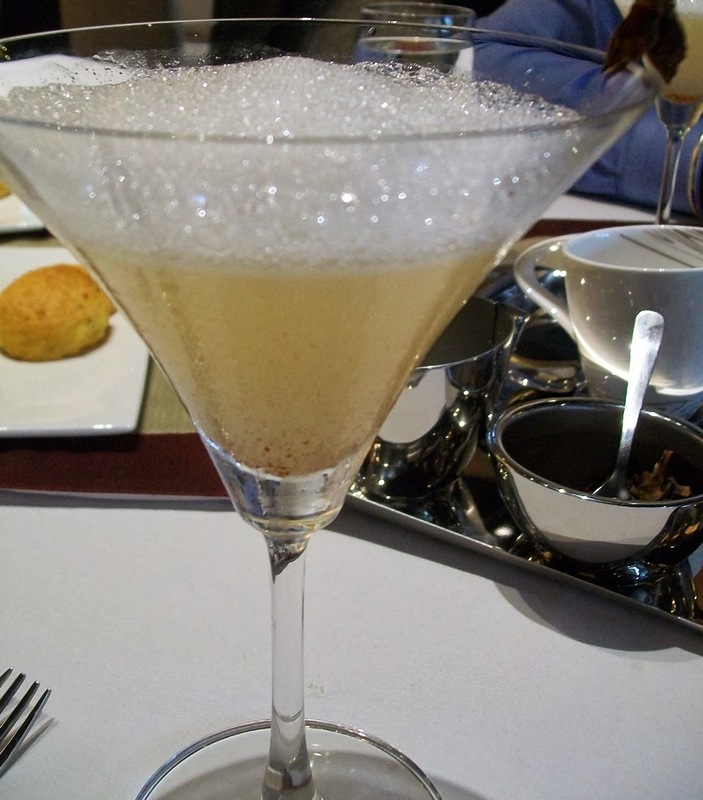 I tried the Star anise martini – gin based cocktail topped with star anise foam. Surprisingly despite its strong flavour star anise didn’t overpower the drink and only gave a subtle hint of its existence. 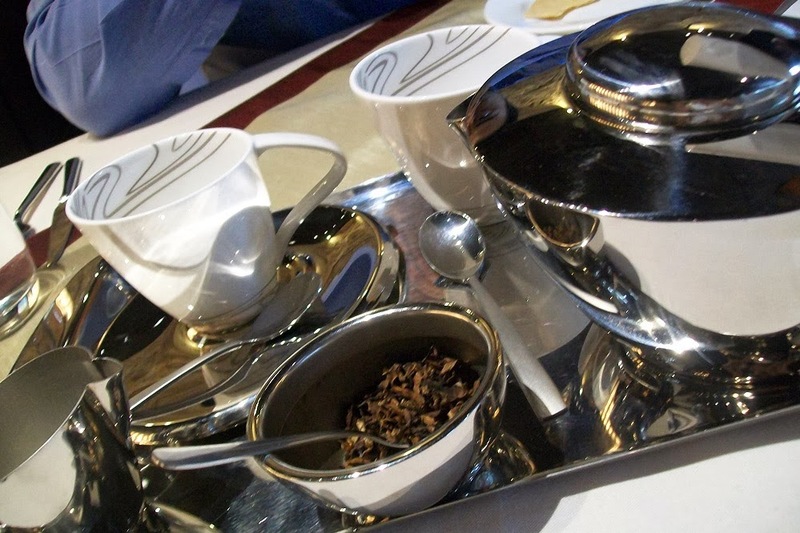 I was surprised when our server appeared with a tray carrying cups, a tea-pot, powdered milk and tea leaves because I was clearly not expecting tea in the middle of our meal. 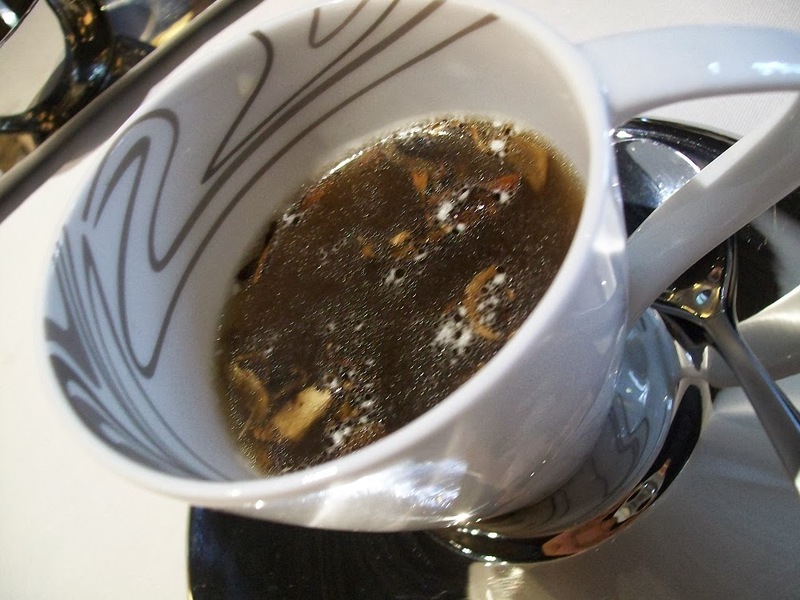 The tea was actually mushroom soup or Wild mushroom chai (Rs 325), the tea leaves were dehydrated mushrooms, milk powder was deconstructed truffle oil and the liquid was mushroom consommé. When mixed with the consommé the truffle oil got back to its original form creating a layer of oil over the clear soup making it a perfect comfort food. The chefs here have played a lot with flavours here to create a dish which truly gives you the essence of that particular cuisine. I loved their version of curd rice; Curry leaf and pepper prawns, thayir sadam, banana crisp (Rs 375) which was served as a salad topped with peppered prawns. It came in a handmade shell placed on a log of a real tree. Environmentalists need not worry because I was told that it’s a recycled piece. The curd rice topped with roasted lentils and curry leaves cut through the spiciness of prawns. 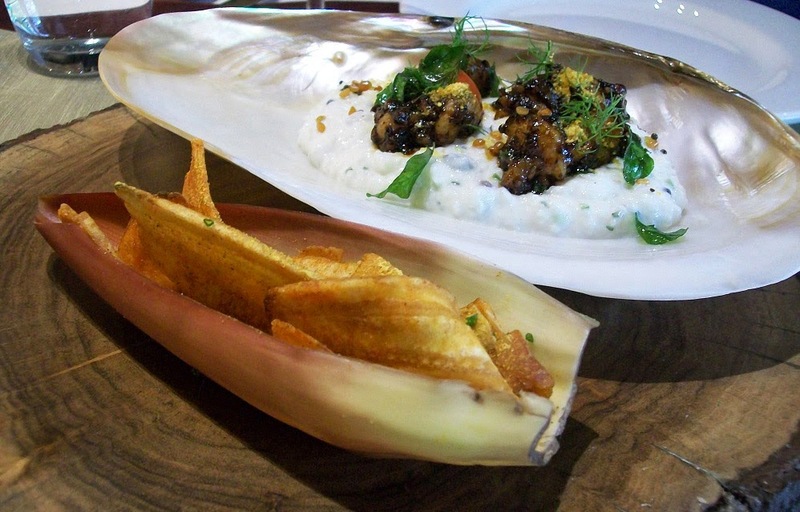 The dish was served with a side of banana chips. From the North region we tried the Gilawat kebab, tawa tikka, varqi paratha (Rs 525) made by the cook from the famous Tunday Kebabi in Lucknow. 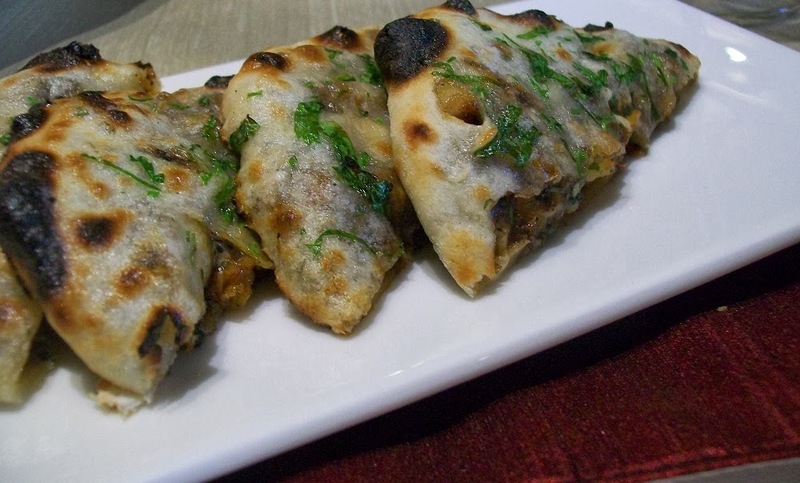 The kebabs were flavourful with a perfect melt in mouth texture and were topped with very tender mutton boti and bite sized parathas. 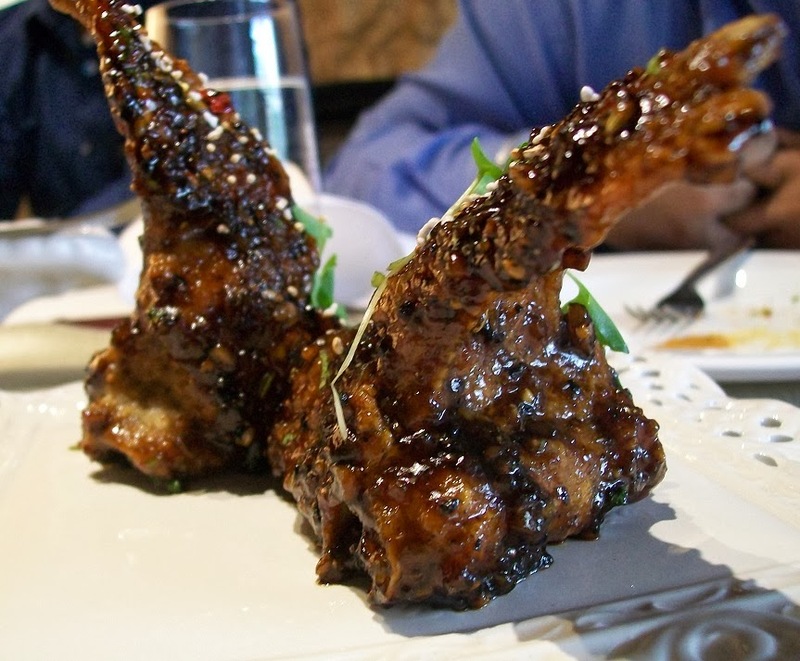 My next indulgence was a meet lover’s delight, Tandoori champ (Rs 595) – a perfectly braised lamb chop with maple and kokum glaze. The meat came off the bone beautifully, had a crispy layer and was flavoured with the sweetness of maple and sourness of kokum. The surprise element in it was the sweet mango pickle which is a regular in any North Indian household. The second drink Curry leaf martini was an interesting take on vodka based martini flavoured with burnt curry leaves. The main course had the authentic dishes of different regions presented in the most beautiful way. We were served Meen moilee (Rs 610)– a Kerela style fish curry made with river sole, Prawn balchao kulcha (Rs 375) – North Indian bread stuffed with Goan style prawn preparation, Dal makhani (Rs 395), Anar and mint raita garnished with rose spheres (Rs 210), Bhindi Jaipuri (Rs 410) – crispy fried okra on a base of choorma with papad ki sabzi. 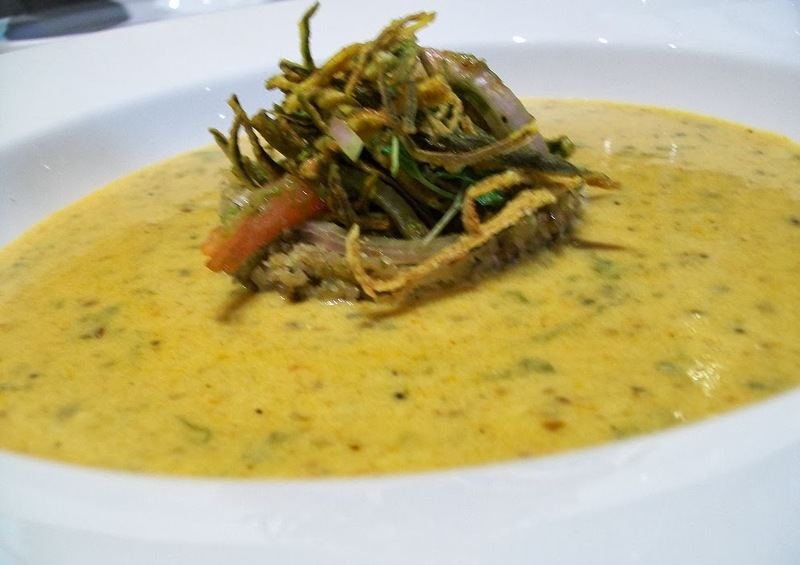 This last dish was a lovely mix of three Rajasthani dishes making it a blend of various flavours; the sweetness of choorma, crunchiness of okra and sourness of the curry in papad ki subzi. All of this was served with a bread basket which had traditional breads like the Lucknowi sheermal (Rs 125), Persian taftan Rs 125) and Kashmiri bakarkhani (Rs 125). I was dying to eat sheermal since ages but sadly no place makes this bread in Mumbai. Now, I know of a place which does. I got the taste of molecular gastronomy once again with desserts. The Chocolate (Rs 1000) – brownies with chocolate mousse added a little drama to the meal where the Chef converted mousse into an instant ice-cream by pouring liquid nitrogen over it. 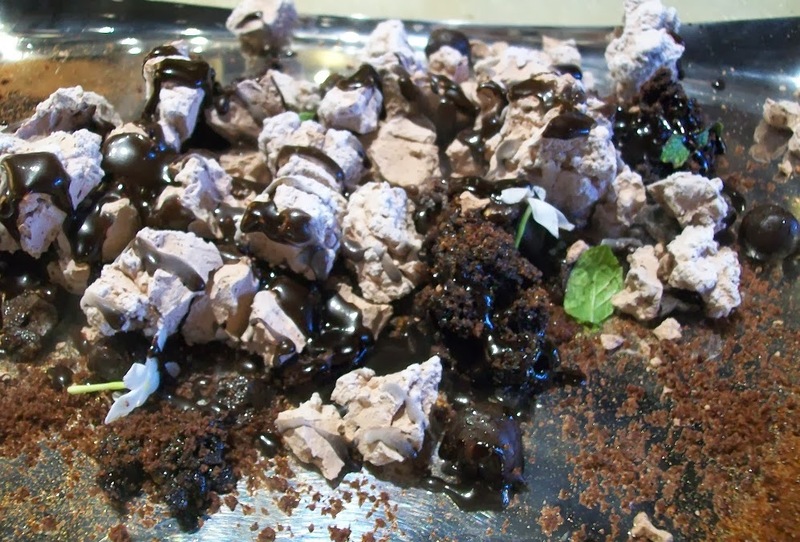 The ice-cream was then shattered into smaller pieces and served with hot chocolate. 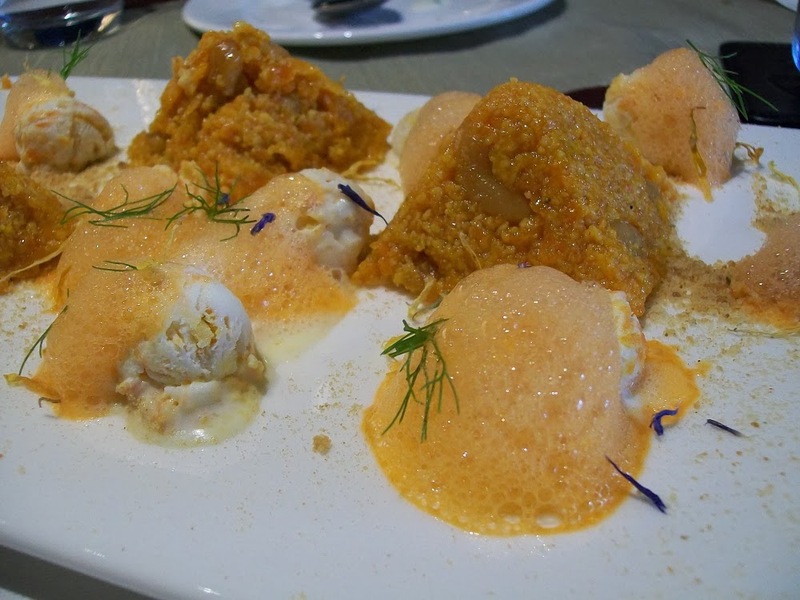 The good old Gajar halwa (Rs 375) was a three way carrot with an addition of gajar halwa flavoured ice-cream and carrot foam. But it wasn’t the scientific cooking that impressed me in the dessert section. I was blown over by the Indian version of cheesecake, the Ghewar cheesecake (Rs 375). 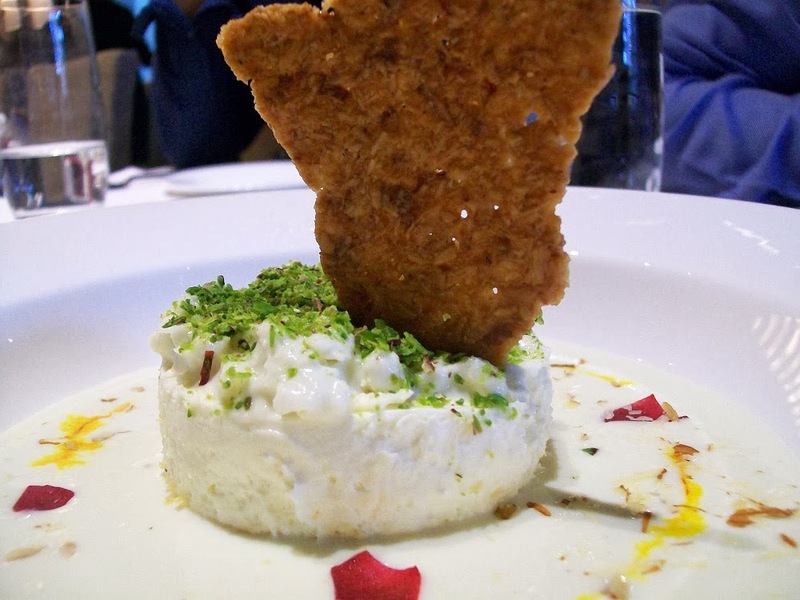 The absolutely sinful dessert had a base of ghewar – a Rajasthani sweet, topped with a layer of cheesecake, garnished with flaky rabdi and pistachios and almond chikki and finally thick rabdi poured over it. 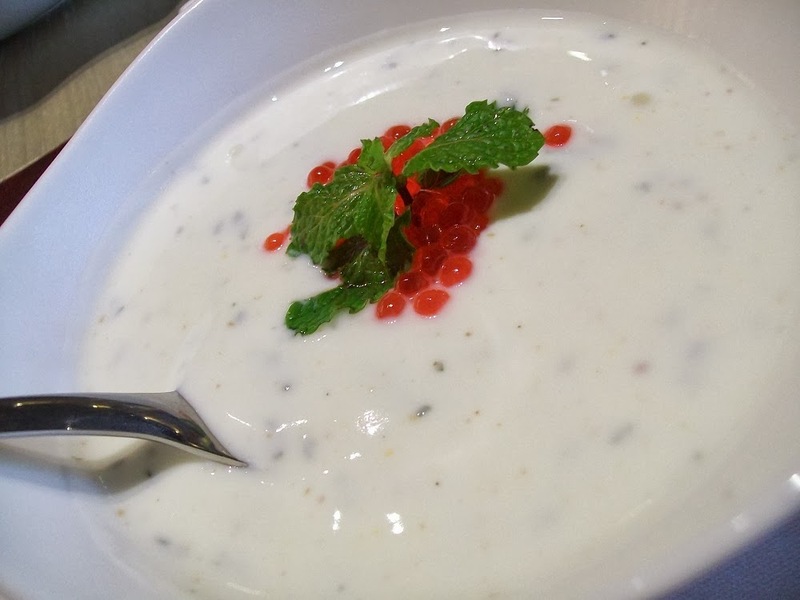 The combination of various flavours and textures makes it one of the most innovative desserts in the city. 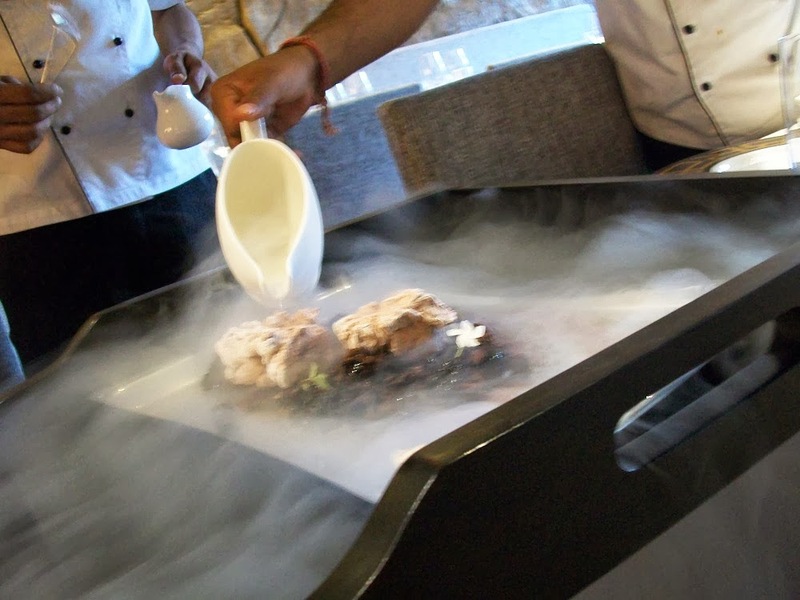 Apart from the varied menu they also serve Pan flavoured candy floss, Nasik orange sorbet with kafir lime frozen air, Frozen mishit doi popsicles as palate cleansers. The Chefs at Masala Library have played with every sense to give an experience which pleases your eyes, nose and most importantly the taste buds. Masala Library takes Indian cuisine to a different level and from what we’ve seen; their aim to be in the Michelin Guide doesn’t look far.